Saratoga's Donald Prolo finished 23rd to help the Falcons finish fifth at Central Park. The best of the Santa Clara Valley Athletic League took a little run through the park in Santa Clara last week with the annual running of the Central Park Invitational. Jacob Christopherson of Saratoga and Jeff Whitsett of Lynbrook each finished among the best with places in the top 20 in the boys division. Christopherson continued his outstanding senior season for the Falcons by finishing seventh in 12:11 on the 2.3-mile course. Saratoga nailed fifth in the team standings in the boys race, finishing behind Los Gatos, Wilcox, Los Altos and Milpitas. 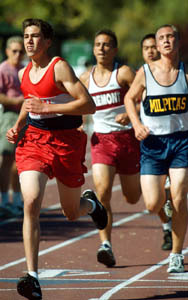 Christopherson led the Falcons by finishing seventh overall. Don Prolo was 23rd in 12:44 with David La 26th in 13:04, Brett Stanger 38th in 13:35 and Justin Gardner 47th in 13:44 and Trevor Adams 48th in 13:45. Francine Lee was 24th in 15:45 for Lynbrook in the girls' race with Joanna Burgess of Saratoga 32nd in 15:57. Saratoga's Dernie Wang was 45th with teammate Carol Liu 46th in 16:47. Freshman Chris Deal rambled to a second-place finish in 13:02 to lead Lynbrook to a team third in the boys frosh-soph division behind Santa Clara and Fremont. Eugene Berson ended up sixth for the Vikes with Chad Smith 10th, Morgan Katz 35th and Jason Whitsett 38th. Saratoga's Jacob Osborne ran a solid 12th in 14:09 with Daniel Yang 27th and Steven Surrette 32nd. In the girls junior varsity division, Lynbrook ended up sixth overall behind the efforts Kim Sasoon, who was eighth in 16:33, and Evan Smith, who finished 12th in 16:53. Stephanie Claussen was 41st. Stephanie Le ended up 51st overall in 18:16 for Saratoga. Saratoga finished third in the team standings in the boys junior varsity division behind Los Gatos and Wilcox. Ian Kolb led the Falcons with a sixth-place finish in 14:01. Lee Blair was 15th with Tony Yui 23rd, Devin Lui 30th, Clarence Tam 36th and Randy Scialabba 37th. Kevin Perng was fifth in 13:59 to lead Lynbrook to a team fifth.